2009 has arrived and I must say I have a had a good year so far:-) 2008 was good also; however, my Sisterlocks and I were having an ongoing battle. After months and months of contemplating my next move I decided to cut them out. Luckily, I did not have to cut a lot of my hair and I was able to keep some length. So 2 days of my boo and I conditioning, washing, picking, and cutting I was able to put a comb to my scalp! I am going to miss the Sisterlock family but it was a nice journey. And of course I'm still NATURAL! Take a look at the new do! WOW!! Your hair is beautiful!! Awwwww. So sad to see my SL inspiration put to rest...but happy to see you are satisfied and happy with your "new" do! Your hair is still very pretty! Peace & Blessings in '09! Thanks ladies! It was just a battle with getting them to look the way I wanted. You and your hair are beautiful as always. You will always be part of the family!!! How did you want them to look? Like straight hair? You look great though. The shine from your hair is wonderful. You'll miss your locks and go back. Shavonne - I wasn't trying to get the locs to look like straight hair. I had a lot of frizz throughout my head for the past year. No matter how many groomings or retightenings I got it was still frizzy and with frizz brings "BIG HAIR" and that's not me. I contemplated for months so I wouldn't make any hasty decisions and I had a date of 3/13/09 (my bday) if I wasn't satisfied I'd cut but on 1/1/09 something took over:-) I really can't say that I would loc again but who knows what the future holds. Oh, nice blog by the way! Go for it!!! I'm sure I'll be admiring your locs! Oh, I forgot to mention that LaMonica cut her locs also...she gave me the ultimate courage to do it. OOh. Frizz. 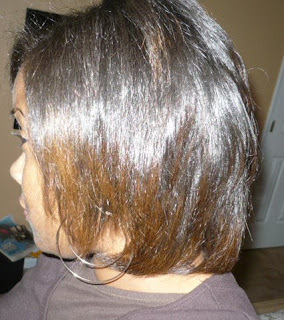 I'm not a fan of frizzy sisterlocks either though I couldn't tell it from your pictures. Perhaps I would have noticed if there was a picture of you with the sun behind you. A missed opportunity. And thanks for the complement on my blog (shavonne.org?). That's my baby. I actually want to shave my hair off rather than lock it but I have a funny-shaped head so shaving isn't an option. I just don't like hair and the less I have to deal with it the better. My baby sis lives in the ATL and says its super humid, so I understand about the frizz. Your locks were beautiful, but so are you no matter what hair style you are rocking. I want my locks to be like yours when they grow up!!! You have to do, what you have to do. You rock the loose natural just as gorgeous. I have to say I am disappointed at you and LaMonica. I don't know why I am but I just am. I don't know either of you. Both of your hair looked simply beautiful. I wish you keep it in but it is your hair. The new fro looks nice!! I remember seeing you at the MLK march and almost drooling at your SLs. You were definitely my SL inspiration. So sad to see your sisterlocks go, however you are beautiful either way. OH MY Gosh I'm mad at you!!! Not really, but I am. I saw your blog over a year ago and I absolutely loved your hair. You were my inspiration for investigating sisterlocks a little more. I guess its over now though maybe I could try something else because I would probably end up doing the same thing you did. GL in the '09 to new hair and relationship. Peace. I am seriously mad at you an Lamonica! I 'm just kidding do what you must to be happy :>) BTW i will be visiting ATL in the next week or so can you recommend someone good to cut my locs in a bob style sort of like you and Lamonica's sisterlocks early on? Omg! I didn't see that coming from a mile away. That battle you had is one I had twice so I know what you are talking about. That's why I took my last 2 sets out so I don't blame you. 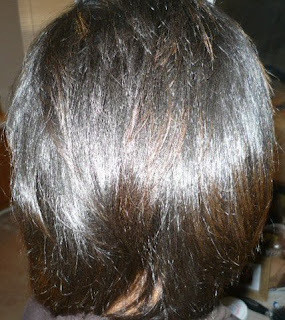 However, your hair looks so healthy with lots of sheen! Wow! Did you let the color grow out some before you took them down? Do you have any pics. of Lamonica's new hair style? You are looking fabulous! Wow, you were one of my inspirations too. Your locks always looked so cute, especially with that cute cut you had. I wish you the best though. You still styl'n and profil'n. Thanks again for the feedback ladies. I have really been enjoying the "new do" for the past couple of weeks! Lashaune - the stylist that cut my locs has moved and I don't have a number for her but I will try to locate her for you. I'm glad my Sisterlocks have been such an inspiration to some of you! Do what works for you! I cut off my 8+ yr. locks, and for a month or two, I enjoyed my hair, but now i miss my locks, and can't wait to grow this 2nd set. the pic on my blog is the first set after 6 yrs. I too am thinking about restarting my locks and as they are thin would like some advice on takedown, apart from getting them cut, did you use any products to help ease them out? Desi - the only thing I used was a conditioner to help soften and loosen the locs. They basically brushed out after that and we had to pick a few and cut some that wouldn't budge. I used the conditioner that comes with the hair dye. Your hair looks great. It is goood to see that if I every decide to, that I don't have to cut all of my hair. I'm thinking of cutting my locs similar to the bob you had. But like you stated, I want to make sure I'm sure. Your hair is still gorgeous. Locked or Straight! Wow, FANTABULOUS!! I was trolling around, haven't post in a while myself and I checked in on you. LOVE the hair and I truly understand the dilemma you had. This is my second set as well and I'm still not so happy.. Trying to hang but seeing your new look is giving me the fever!! Did you perm it or is that a Dominican blow dry?? LOL!! Do your thing girl. You can rock any look! Thanks Ladies! Wanda, I go to a black owned and operated full-service salon. I do not do the Dominican salons because I'm into hair care. I found a stylist that treats my hair and also styles it. A sistah! 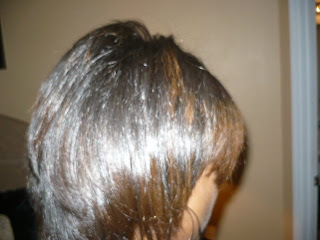 No perm just a good hard blow dry and some stove irons will get it done! Your second set...how did you go through it again!?!? 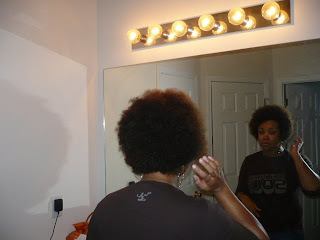 Hi,I am considering saying bye-bye to my sisterlocks too, but was thinking about growing them out. After finding your post, I may consider taking them down. 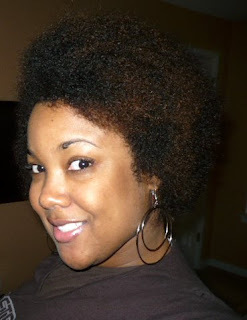 You are are beautiful with/without sisterlocks! Wow, you must have read my mind! I have been contemplating removing my S'locks for a while now (I've had them almost 6 years) and had given myself an April deadline, but lately I am feeling more and more ready to get them out (especially with all my frizz). You've inspired me! I love the new 'do. Love the new hair! I am originally from Detroit. Please tell me where you got the Detroit Sout tee shirt from? Hi golden_08, First and foremost you're beautiful with and without the locs. After much prayer and contemplation" I've also made the decision to take/pick out my 2.5 yr old locs but I'm not having the best of luck...I need the play by play. I'm conditioning, I'm washing, but to no avail I'm still locked. Did your hair have to be soaking in order to easily pick the lock out? Did cutting the ends help? Any suggestions would be greatly appreciated. 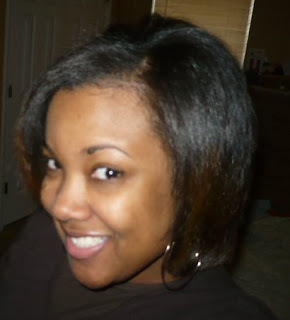 Anonymous 1 - I'm glad you were still able to enjoy the blog with or without the locs:-) Send me an email and I'll send you some recommendations. Anonymous II - We didn't soak them but my boyfriend said they were easier to take out with moisture. Are you in Atlanta? He said he'd take them out for a small fee...lol. 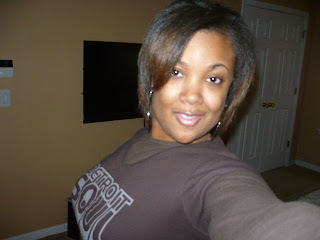 Locin' - I got the tee from the Detroit Tastefest last summer. I want your blog to remain in the LHBE because you have a nicely documented journey. If you decide to close down this blog, let me know. Thanks for sharing such a beautiful journey with us! Hi!! I just came across your site today after contemplating SL!! Your locs were simply Lovely!! !Like everyone else, I love your hair both ways!!! I am in Atlanta too. Could you recommend any SL consultants? Thanks and Keep that hair FIERCE!!!!! Please email me @ kdenise2380@yahoo.com...Thanks so much! And please keep this blog up, I know it seerves as an inspiration to so many!! Blessings in 09 and Beyond!! The main thing is she's still natural, so you shouldn't be disappointed... As India Arie says "I AM NOT MY HAIR"